Indianapolis, IN (December 10, 2016) – As the 2016 ARCA Racing Series champs, Cunningham Motorsports has a lot to celebrate at the Series banquet later this evening. But, they certainly aren’t resting on their laurels…they are looking forward to next season, when they plan to contend for back to back championships. The first order of business at the press conference, held in conjunction with the annual PRI show, was Jeff Clark, speaking on behalf of Ford Performance, announced that the Cunningham organization has been designated as a driver development partner with Ford Performance. 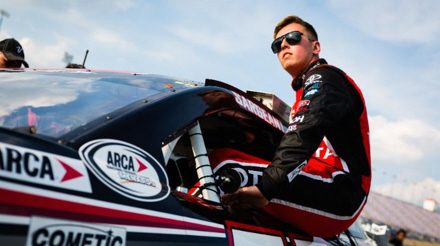 The ARCA Racing Series 2016 Rookie of the Year, Sargeant competed in 15 races during the season with one victory, 10 top-5 finishes and 12 top-10 finishes. The 18 year old’s checkered flag came at the .4-mile Berlin Speedway in Marne, Michigan. In addition to the ‘W’, Sargeant’s 5.47 average finish included second place finishes at Toledo Speedway, Winchester Speedway and Kentucky Speedway. Throughout 2016 Dalton also competed in select late model events. In addition, the 18 year old from Boca Raton, Florida, who is a member of the 2015 NASCAR NEXT class, competed in three NASCAR Camping World Truck races in 2015…with a career best finish of 9th at Bristol Motor Speedway. In addition, Dalton grabbed the checkered flag in the first NASCAR K&N Pro Series West race of 2015 at Kern County Speedway and made his NASCAR K&N Pro Series East debut at New Smyrna Speedway with a second place finish. Finally, the time has come for the Cunningham organization to celebrate their 2016 ARCA Series championship…as the final piece of the 2016 season falls into place. The Series banquet takes place this evening at the Indiana Convention Center in downtown Indianapolis, where the No. 77 Big Tine team will earn many honors after finishing the season with six victories, 6 poles, 14 top-5 finishes and 18 top-10 finishes.